When it comes to contemporary art in Zambia, without doubt Carol Aslin is the queen of fantasy. 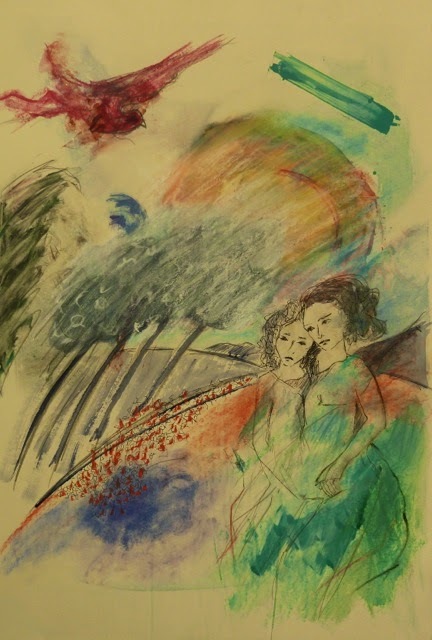 She always seems to have the gift and ability to draw us into her dreamlike world of charming fairy-tale, flower fields, angels and space travel. She never shies away from her European heritage, this seeps through in her more realistic works in the form of a neo-impressionist colour schemes, references of romantic Victorian imagery that feature women in long flowing frocks, and subject matter such as boating and horse riding herself being an avid rider and winner of an international tournament or two. Her last solo exhibition entitled Dreaming, that was held at the Alliance Francaise in Lusaka was not just entertaining but it was also a commercial success if the red dots (sales stickers placed beside a work of art to indicate it is sold or booked) were anything to go by, meaning she must have done her ground work, perhaps by inviting the right people to the opening. This year Aslin returns with a show of about 25 works, a mixture of paintings, monoprints and drawings entitled "Split Dimensions" that runs from 29 August to 4 September in which she explores the beauty and humour of nature and the fragility of Life. Unfortunately her latest show is strictly by invitation at a private residence in Lusaka but if you are not invited and really insist on seeing the work you will have to contact the artist through her website which can be googled by typing in her full names. But although she mentions sadness and death, these are concepts relatively hard to trace in her work whose mood – by means of colour – is happy and to a large extent full of life, hinging on playfulness. On the technical side she uses oils on canvas or board as well as printing inks on 300grm paper. She has spent a lot of time experimenting with different materials and techniques and often works on several pieces concurrently when in her well-equipped painter’s studio in Kabulonga, Lusaka. 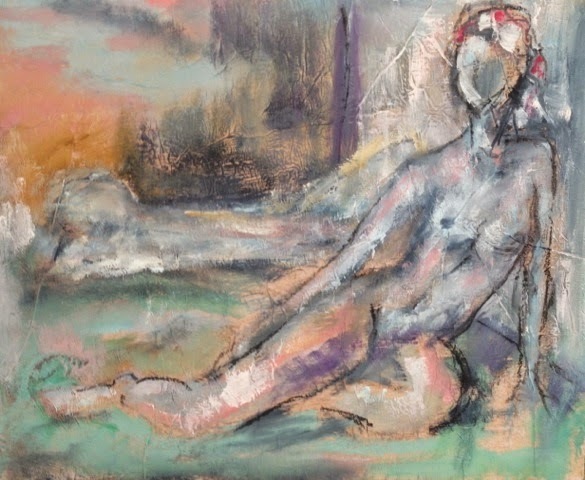 Earlier this year she exhibited in London at the Chelsea Arts Club where she has been a member since 2013, while there she also spent some time at Heatherley’s Art School working in printmaking, painting ,life drawing and sculpture workshops. Carol was born in Zimbabwe, grew up in Kitwe on the Copperbelt and was education in South Africa. After school she moved to London where she worked in film. She later moved to New York and was a student at The Art Students League and the Parsons School for 5 years. After her US stint she returned to London and there she worked at Old Master Paintings in Piccadilly, still restless, she started her own interior design company. In the late 1990s she returned to Zambia and this time she settled in the Luangwa Valley. She fell in love with the wilderness and started producing landscapes and wildlife paintings as well as some abstracts that she would bring to Lusaka for exhibitions, Musikili, Ababa House and the Alliance Francaise being her favourite haunts for the past decade. During this period she attended Ernst De Jong’s Art Academy in Pretoria where she painted for 3 years as a visiting artist and is part of the group he has named “The New Individuals”. The influential academy is responsible for some design products that include The South African Banknotes; Five Roses Tea and South African Bureau of Standards among many others. To date, Aslin has been featured in 18 group and solo exhibitions in Zambian and abroad her paintings are now all over the world and in various Collections including the Lechwe Trust. Feeling a creative urge while travelling to South Africa last Sunday I thought it was time to start seeking my long lost drawing hand, so I decided to pack a few pastels and sketchpads that were gathering dust on a cupboard shelf. “Maybe it’s time to fill these old sketchbooks with some drawings and see whether there is any skill I can spew forth from this creative soul that has been in artistic purgatory for well over a decade,” I thought to myself as I dusted off two A3 sketchbooks, a large format 40 cm x 50cm canvas pad and a couple of Rolfes Soft Pastels packets. When I was getting the luggage out of the car at the Kenneth Kaunda International airport in Lusaka, a friendly porter from the National Airports Company Limited walked up to me with a beaming smile, offering to assist with my baggage to which I gladly agreed. Inside, hugging my family goodbye knowing I will not be seeing them in quite a while, I made my way through the first screening point for international departures. After my two bags, one with laptops and the other with personal effects had both gone through the X-ray machine I stood looping my belt back into my trousers only to be surprised by one of two NACL staff manning the machine. “Whats in the bag? I will have to open it” she said with an uncompromising look on her face and open it she did, before I could even respond. Now, I have seen a good number of airport security check points around the world, even some that are ranked the strictest, so I stood in bewilderment wondering why I was being questioned while leaving and not entering my own country. Speaking of which, the Zambian National team jersey I was wearing and the name in my passport that is more common than a Kwacha did not seem to put me in any friendlier position. At this point the officer had already plucked the two packets of pastels that were just on top of some papers in the bag that contained my personal belongings. She was immediately joined by her colleague who had now abandoned the X-ray screen to join her with the inspection. “What is this?” asked the second officer towering above me and waving the two boxes that are barely the size of a school mathematical set. “Read the box, doesn’t it say anything,” I snapped, my irritation only worsened by my embarrassment at the whole affair as the queue stopped moving and a pool of fellow travellers swelled up behind me, it was a busy day by Zambian standards with three international airlines being processed simultaneously. He opened the box clearly puzzled, I could see him trying to make something of it and all the while I had a large sketchpad under my arm hoping it will give him a hint that these were artists’ materials, which perhaps may not have been fair on my part, this was Zambia after all, one does not see art supplies every day. The second time he asked me what they were I ignored him owing to the fact that apart from carrying out his duties – which was understandable -- his conduct was extremely impolite and he had a permanent scowl so severe I was convinced it was surgically fixed on his face. By now, his colleague had already demanded my passport and took to recording something from it into a large book, for what purpose I do not know; when she was done she returned my passport and joined her colleague who had gone back to the screen to get the queue moving again. “Are you going to put my things back in the bag and zip it because I’m not going to do it,” I asked her, seeing her workmate had just placed them on top of my open bag and returned to his station. She just looked at me as if I had never said a word and went about attending to the next traveller. When her colleague noticed I will not budge until one of them returns my stuff in the bag he got up and put them back. I thanked him but before I walked through to ticketing I gave both officers a stare that could have knocked them off their seats if only to indicate my unhappiness. For some reason I knew they were probably going to check my bag again perhaps that is why they took the details of my passport, but this did not bother me because my intention was to check it in anyway. All along I kept pondering over the ordeal wondering whether pastels contain some prohibited chemical, or maybe the scanner identified them as bullets or explosives. Anyway, about three hours later I found myself crossing a similar security check scanner at OR Tambo International Airport in South Africa while boarding my connecting flight to Port Elizabeth. For some reason, the scan here took less than five minutes perhaps because it was a domestic flight or the South Africans have their own regulations. I eventually got to my final destination, unpacking my bag I instantly decided to have a go at the pastels that had landed me in trouble at KK International. I took out a sketch book and picked the darkest hue from the 12 colour box because I wanted to attempt a rough drawing. Pastels can either be used for fine, colourful renditions or rough sketching; I chose the latter for practice so I selected black and a shade of brown, staring at the blank sketch pad I tried to conjure whatever came easiest to me. Shaky and with a slight lack of confidence I managed a drawing from imagination, a five minute portrait of an expressionless woman. Far from a masterpiece and not even close to the many works by other artists that I criticize at will every other week, I was happy with my first hand at drawing after 19 odd years. Nevertheless, I later decided to write to NACL to explain my ordeal and to find out more about the seemingly prohibited articles I just managed to make a drawing with. A day later I received a very polite and apologetic response on behalf of NACL from a Levison Siamyungu (Acting Chief Security Officer) explaining that the two officers had “been sternly advised to desist from such behaviour since the Aviation Industry calls for good customer services”. “However, may I inform you that in view of the current world-wide aviation security threat alertness our security screening processes have tightened up such that even items that used to be viewed as non-suspect substances like “CORN-FLAKES” are now being critically examined. It was on such grounds that those security personnel critically examined the artists colour “Pastel” which was in your luggage,” read the e-mail in part. As much as I appreciate the sincere apology, I am Zambian and do not really have a choice as I will always return home whether harassed or not, but I can only imagine if say I was a foreign wildlife artist for instance, carrying some pastels, or if I had bought them as a gift I do not think Zambia would continue to be on my destination list. Anyhow, to all artists that use pastels, if you do not really need them when you are travelling leave them behind, to NACL security staff these chalk-like items that resemble crayon are used to create art, they cost about K70 per box of 12 and can be purchased from leading stationary suppliers, book stores and the Visual Arts Council of Zambia in the Lusaka Show grounds, they are fun to use and are a favourite even among kindergarten children. But what is it with Zambians and naturalistic portraits? Do we just enjoy seeing our likeness in a well framed, drawing or painting or do we like doting over our images like the handsome young man Narcissus of classic western mythology whom it is said fell in love with his own reflection ignoring the affections of a goddess and was turned into a flower bearing his name? One may argue that our passion for the portrait was inherited from our colonial masters; after all, in the west portraiture has for a long time been used in the very symbolic manner of emphasizing power and has been central to noble culture as art historian Joanna Woodall suggests in her introduction for the book Portraiture Facing the Subject. Certainly a forkful, but it does hint that probably by legacy, we too have adopted these notions. When one reaches a certain level on the social ladder one feels it is time for them to hangar painted portrait in the living room or office. Of course during and shortly after independence a number of official portraits were commissioned possibly to replace those hung by figureheads of the colonial regime such as the last governor of Northern Rhodesia Sir Evelyn Hone, one of which can still be seen at the Lusaka National Museum. Some of the finest specimens of these “replacement portraits” are the 3 Kaunda portraits commissioned by the Zambia Consolidated Copper Mines who in 1990 engaged British painter Oenone Acheson at the close of the first president’s 27 year old reign. Paintings and the more affordable pencil drawings have continued to be the supposition of a status symbol, particularly when not commissioned as a gift which may explain why a good number of Zambian celebrities and successful young professionals have taken to ordering portraits almost to the point of competition. But then again, while it can also be debated whether taking up portraiture as an artist means accepting to be in the rungs of a theoretically low genre in terms of artistic hierarchy, owing to its duplicative nature. Nevertheless, a good number of Zambian artists, including some of the most prominent take it up as a life line and good for them. 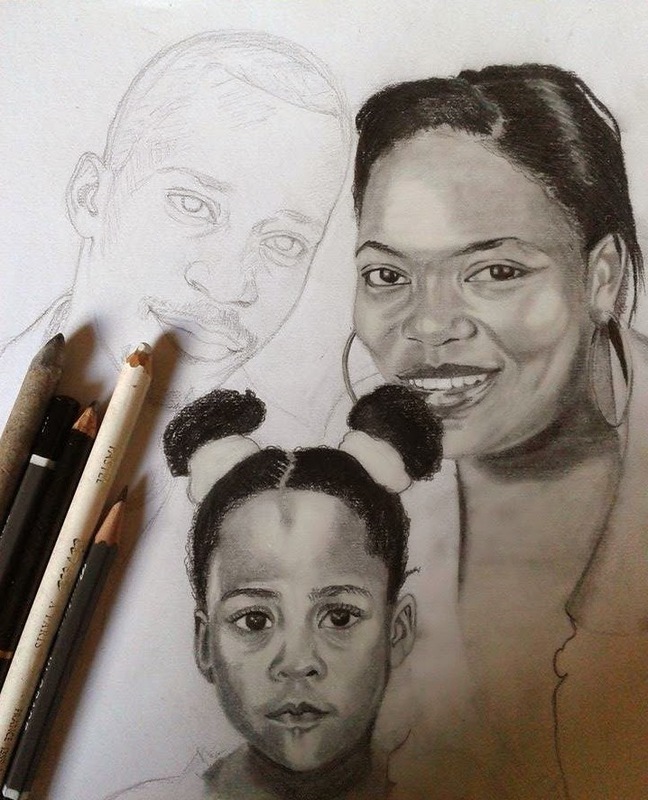 Decent portraits cost anything between K300 (three hundred) to K5, 000 (five thousand) depending on the size and medium. It may not be a jackpot, but depending on the frequency the money is good enough to keep an artist going in-between the odd group exhibition and the scarce solo. Sadly, visits to individual artists’ work spaces often reveal a portrait that has not been collected because clients tend not to understand that professional materials such as imported paints, canvases and fixers come at a cost and artists have to break even when they factor these in with their talent and time. So often clients and artists will end up in negotiations that can be likened to a flea market haggle.